Once again, Congress is scrambling to keep the government funded at the eleventh hour to avoid a nationwide shutdown. Many are focusing on the partisan bickering over certain details of the federal budget – though, after clearing the House, it looks like it’s on its way to be passed by the Senate. Thanks to all the drama, it’s easy for some aspects of this bill to get lost in the noise. New York Democratic Sen. Kirsten Gillibrand has made it her personal mission to overhaul the rules regarding sexual harassment on the Hill. One of these major reforms would involve how harassment settlements are paid. As it is now, politicians in Congress can cover these settlements using taxpayer dollars. Maybe just as problematic, public disclosure of these settlements is forbidden. Gillibrand aims to change both of these practices — first by requiring settlements be paid by the lawmaker responsible and not by taxpayers. She also wants victims of harassment to have the option, if they so desire, to make details of the settlement public information. Since the end of last year, it looked as though the New York senator was on her way to achieving meaningful progress. 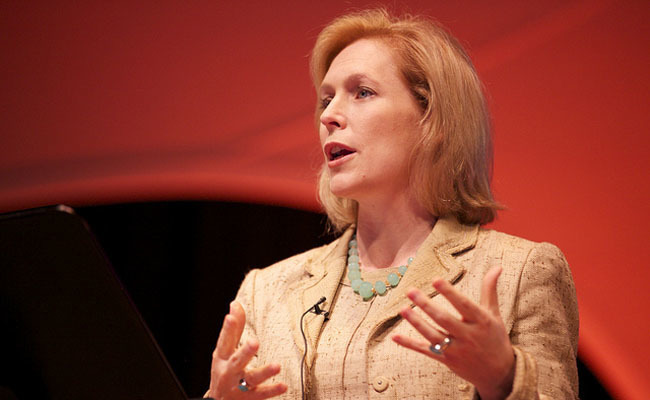 Not only does Gillibrand have a number of her fellow Democrats behind her, but Republican senators have also stepped up to back her – including Sens. Ted Cruz and Lindsey Graham. Three months later, Gillibrand had managed to draft an attachment to the currently debated federal funding bill. This included her desired changes and had the backing of 20 prominent senators from both sides of the aisle. Even still, at the last moment before sending the bill to a vote, Republicans in the House of Representatives snipped out Gillibrand’s attachment. This version of the budget bill was approved and is now on its way to the Senate. Why, despite having bipartisan support, did House Republicans made this sudden modification? It’s certainly cause for skepticism. After all, if members of Congress aren’t sexually harassing their staff and their peers, then what possible objection could be made against Gillibrand’s reforms? Well, the answer is obvious: There are House Republicans who don’t want to actually be held truly accountable for their sexual misconduct. Is this not is an admission of guilt? Conveniently, the public is not privy to the names of those Hill Republicans who supported nixing these changes from the budget bill. However, there may be an obvious, straightforward solution. Sen. Gillibrand and the 20 senators who back her should draft a bipartisan bill, including her reforms, and send it to a public vote. That way, one of two scenarios will play out: Republicans will either be shamed into supporting the bill to protect their reputation or they will oppose the bill and make themselves known to the public. In the #MeToo era, the most powerful people in our country cannot be allowed to live outside of the law — and it’s especially outrageous that our elected lawmakers are not held personally responsible. If you agree that legislators should draft a stand-alone bill to make key sexual harassment reforms, then please add your name to this Care2 petition to tell Sen. Kirsten Gillibrand that you support her campaign! And remember to share it with friends and family, as well as on social media. Anyone who opposes this needs to be called out immediately. They want to protect their own, and use taxpayer dollars to do it. I knew it. Didnt I say they are sneaking things through every time they say they will do something outrageous? Talk of allowing ivory, they know will cause a stink. While we are scrambling to prevent that, they know we wont notice. Its intended. Its classic behaviour of seasoned manipulators. Watch and be ready, I say! Why would the GOP want it to pass? Signed.